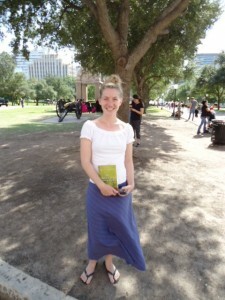 Katrine Brondstedt, a teacher from Denmark, introduced herself to me after a reading in Austin Texas. She said The Calcutta Chromosome had made such an impression on her that she had traveled to Calcutta and searched out every site mentioned in the book. Robinson Street was the most difficult to find. No one seemed to know where it was and she had begun to wonder if I’d made it up. But then she found it. Indeed, I could not find Robinson street, though google maps says it must be near Park street. I walked all the niches and nooks between the Maidan and St. Paul’s. Once also under a monsoon downpour — in case it might be auspicious, but it was not. No taxiwalla or rikshowalla seems to know about it. I am glad to read that it exists, I’ll find it next time I go to Culcutta.